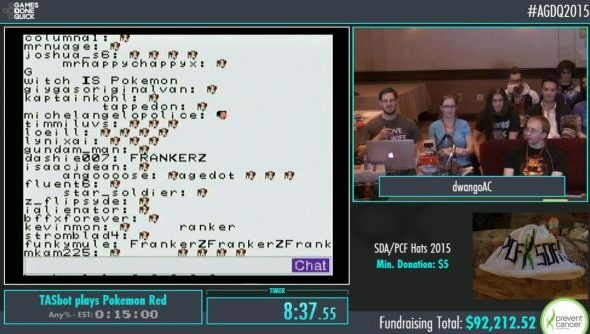 Charity speedrunning festival Awesome Games Done Quick is going on right now. It’s a communal showing-off where people capable of running from the left-hand side of the screen to the right faster than average are rightfully lauded are heroes. Lots of money is being raised for Prevent Cancer, and new ground is being broken in the field of meta-hacking. You’ve seen what happens when Twitch Plays Pokémon. Now witness the reverse. The highlight of this year’s marathon so far has been yesterday’s TASBot demonstration. The Tool-Assisted Speedrun robot ably took on Pokémon Red in the conventional fashion, before trying something completely different. You can see the results emerge about eight-and-a-half minutes into the video below, to disbelieving applause. It takes maybe 30 seconds or so for the Twitch contingent to cotton onto what’s happened. I imagine this is what a 15-year-old John Carmack would be doing today. What do you make of Twitch’s new chunky aesthetic?